We’re back with Rueben from SUPboarder and he walks us through the new Voyager range of inflatable paddle boards by Red Paddle Co. Formerly known as the Explorer range, the Voyager range for 2018 includes the 12’6″ x 32″ Voyager, the 13’2″ x 30″ Voyager+ and the new 15′ Voyager Tandem. This video focuses mainly on the 12’6″ and 13’2″. Sitting at work, or stuck on the subway with no headphones and can’t listen to the video? We have transcribed the video below. Welcome back to another SUPboarder review and as you can see I am surrounded by big Red Paddle Co Voyagers. We are going to do the full Voyager range in a sort of review/comparison video. Yes, you should have seen me about 20 minutes ago, try and wrestle this 15′ Tandem beast into the studio, it barely even fits. So if it does fall over and squash me, let’s just hope that doesn’t happen. So what we’ve got here is the 12’6″ x 32″, sort of more traditional Explorer, then it’s now the Voyager range. We’ve got the 13’2″ x 30″ that was also in the Explorer range and it’s now called the Voyager. 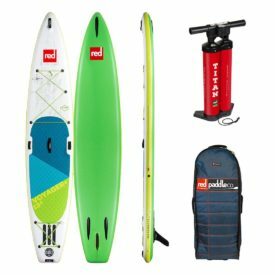 And we’ve got the brand new for 2018 the Red Paddle Co Tandem, which is part of the Voyager range, which is 15′ x 34″. The full specifications for these boards, the two smaller boards, smaller, they are still pretty big, are 5.9″ thick and the 15′ is 8″ thick. 370 liters for the 12’6″, 350 liters for the 13’2″, so a little bit less volume. And 723 liters for the big Tandem. Weight wise, the 12’6″ and the 13’2″ come at a very light 13kg (28.5lbs) and the big bad board, actually it’s not too heavy at resting about 16-17kg (35-37lbs), but to be honest we do find it a bit hard to weigh because of the length of the board. But actually, one person can carry this board quite easily. 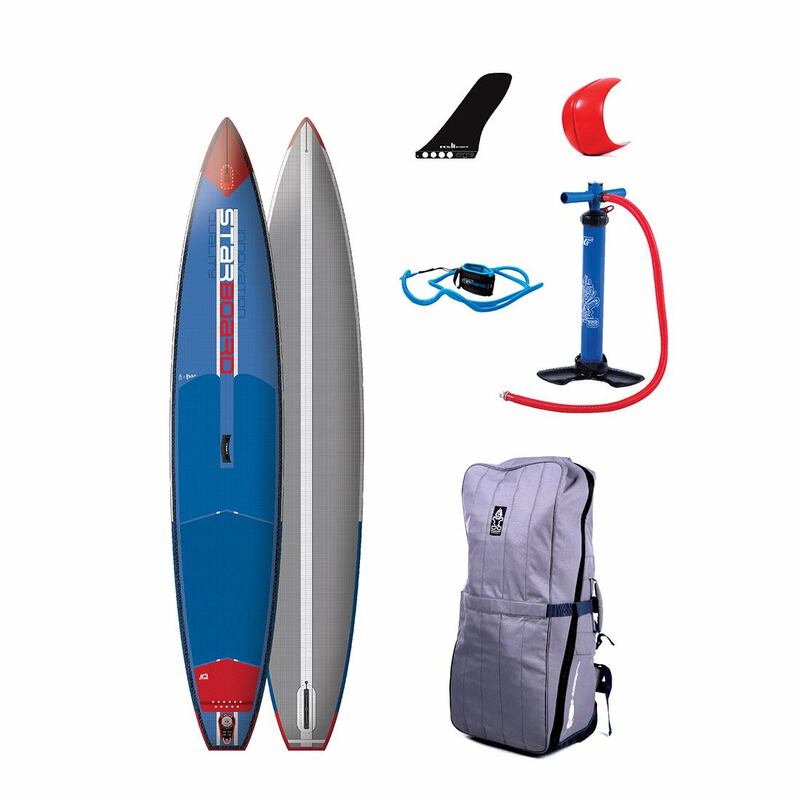 They all come as standard with a central US fin box and a FCS 9″ SUP fin. The retail price for the two smaller ones is $1599 for the 12’6″ and $1649 for the 13’2″, and the big Tandem is $1999. The construction for all the boards is the same, Red Paddle Co use their top end drop stitch with really good quality nylon weave and then finished off with the MSL technology. Remember that’s two layers of PVC overall but the second layer is bonded in one glue so there is no glue residue or extra weight there and no human error either. Gives you basically a really light board, that’s really hard wearing. So moving away from the catalog stuff let’s go on to our SUPboarder impressions. Now really this video alone is really going to be tailored more towards the two smaller boards, the 12’6″ and the 13’2″. The reason for that is because we haven’t used the full 15′ Tandem yet, properly. 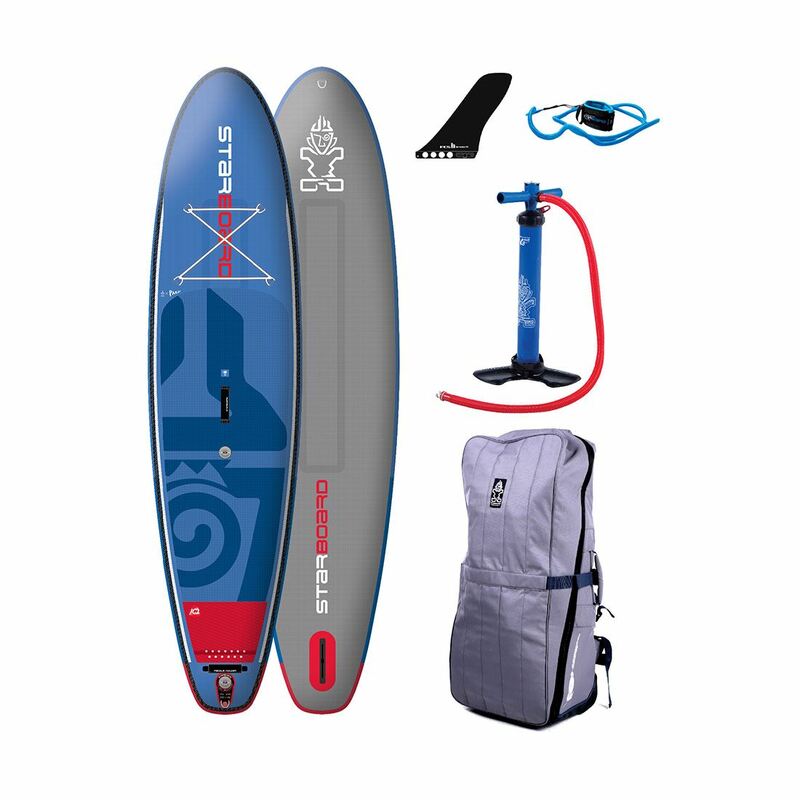 We’ve had a few goes around out the front of the studio, but really, we’re going to take this on a proper adventure with me and Lucy, my wife, and to see if a married couple can get on with a board like this, and see if we’re still married at the end of it. So look out for that blog/review soon, but really we’re going to focus on these two boards in this video. 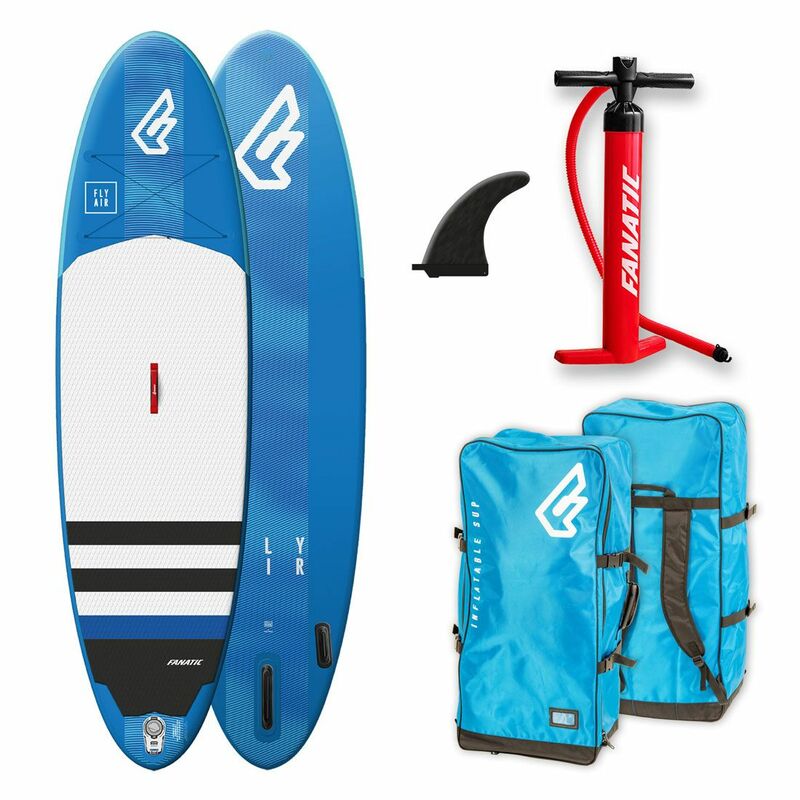 But bear in mind, the fittings and features that are on these boards are on all three of the boards so you can take that away from the review if you’re looking at the Tandem and want to know that now. So the first thing that’s brand new for this year is the look of the boards. Now, with everybody that’s tested it, it’s a love/hate whether you like the look of these boards. I really like mapping/contour lines on the front of the board. Some of our other testers didn’t like it so much. But the color ways, the blues and the greens, did go down well in general, but as always, you guys know what you like. There is so many fittings on all these boards. Starting off with the big 13’2″ because that is the one that has the most amount of gear on there. You have a serious amount of bungee straps you can put a large amount of weight and a large amount of volume on the front of the board. You’ve got bungee straps also at the back. You’ve got your nobbly sort of bungee area which gives grip so it doesn’t slide around on the PVC underneath your dry bag there. Incorporated in the bungees on the Voyager 13’2″ you have got your RAM Mounts up on the left at the front there and at the back. There are RAM Mounts on the 12’6″ as well. 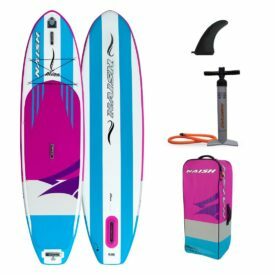 But there are definitely more fittings and features on the 13’2″ because it’s a longer board and you can put things in more places. The handles, the carry handles are all really well made right across the board range, very comfy, and it’s nice how they’ve incorporated them with the RAM Mounts at the front and the leashing point at the back. The fittings this year have definitely gone up a grade for Red Paddle Co they are very well made and they are very thought out and very comfortable to actually use, and very tactile as well. A great example of that is for the deck pad. Instead of just having your standard EVA, diamond grip that you have on some boards, this has got “red” embossed into the deck pad to give you a bit more grip but really, it just looks really, really neat. The deck pads are all different for all three of them, so they’ve had to change deck pads around, it’s just another thing you notice from a brand point of view, having to put more work in when you’ve got a lots of different boards in the range. 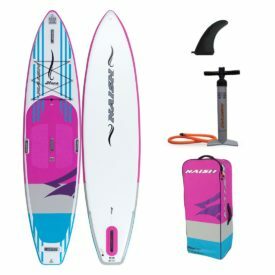 The 12’6″ and the 13’2″ both have RSS Battens, which is rigid glass batten that goes down the side of the board in a pocket, that gives a huge amount of stiffness. During our deflection test, which is where we put a board on a gap of 1.5m and a weight of 75kg (165lbs) in the middle. Both of these boards only dropped 11mm (0.43″), which is not very much of a drop at all. Underneath the board they’ve kept the nose and tail runners, which they’ve had for a few years. A great feature for if you’re paddling really shallow water and you can’t paddle with a fin, it gives you enough drag just to go in a straight line. The fin box itself, is again a nice hydro dynamically shaped fin box to allow the water to pass. 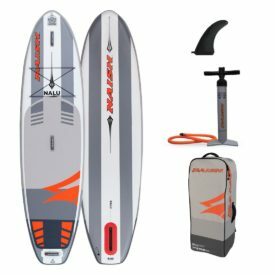 The fin for 2018, they’ve gone for the FCS SUP series Touring 9″. A very nice shaped fin, plastic, very hard wearing. Doesn’t catch on any seaweed. The thing to note this year is that they’ve gotten rid of the FCS Connect system, which was the click in system, which worked really well and was really easy, but sometimes in the touring aspect if you went down the river backwards by accident, sometimes it had a tendency to knock the fin out. So they’ve gone just with the standard US box fins for these ones. 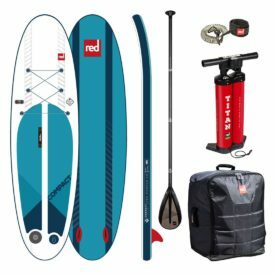 Looking at the pump, you get the Red Paddle Co Titan as standard with the two smaller boards and actually with the big one, you get two pumps, you get the Red Paddle Co Titan and you get a smaller Ezee Pump HP as well because you can actually inflate this board up with two pumps at a time. The Titan, many of you are aware of it, Red Paddle Co were the first company to bring the twin cylinder pump out. A really great pump and actually a great pump to have in a package. Especially if you are pumping boards up of this volume. The bag is a fantastic bag this year. Similar looking to last year’s, when I first got it out, I thought it was the same, but actually on looking at it closely, they’ve got a really neat thing, it’s a really neat thing. On the back of the bag, you can take the velcro off and actually you can get your shoulder straps out and actually go into a back pack, or if you don’t want a back pack, you can put them straight in, fold them up, velcro them up. Really quick, really simple, it really works. Ok, so looking at the shapes of the two boards. Obviously one’s longer, one’s narrower, but what does what. So the 12’6″ by 32″ has a lot more volume than the 13’2″ by 30″. 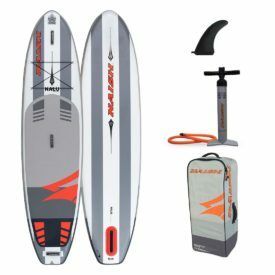 This is how we tested these two boards on the water. 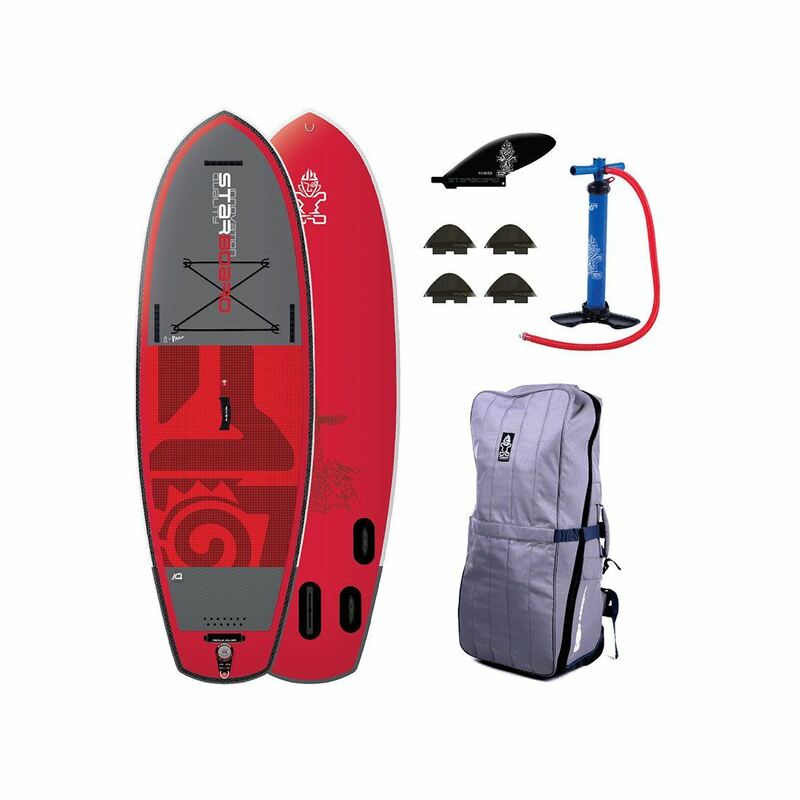 So here we are, we are going to test the Red Paddle Co Voyagers, we’ve got the 13’2″ here and the 12’6″. The best thing that we’ve worked out, we’re going to put a weight of 15-16kg (33-35lbs) and that bag has got 5-6kg (11-13lbs) in it, spare paddle, usual sort of stuff you’d take on an expedition. Lucy is going to geoSUP it, with the app, paddle down the estuary and then come back up. See what the readings say and also see how the board feels in general. So first up the 13’2″ by 30″. So by doing that simple but quite quick test we tried to control as much as we could in terms of weather and tide to give us the best readings. 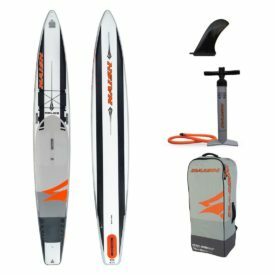 Overall the biggest thing we noticed straight away is that the 13’2″ did have a lot more glide to it than the 12’6″, which is to be expected, especially carrying the same sort of weight. Over an average speed, the 13’2″ was slightly faster than the 12’6″, but there wasn’t a huge amount in it. Generally when you are paddling, you do feel that the 13’2″ was more efficient and it was also much a drier board if you are paddling in chop and moving water. The 12’6″ did handle a large amount of weight and actually felt more stable than the 13’2″, especially in choppier conditions. But because of the lack of length, it did have a bit more water coming over the board, so your stuff at the front was getting a little bit wetter. The interesting thing when you are paddling these boards and you’ve got to bear in mind what sort of conditions you’re going to be paddling in with this. If you’re paddling into wind, dead into wind, yeh the 12’6″ is a little bit wetter, but they both go into wind pretty easy. Downwind it’s the same, maybe the 12’6″ a little bit wetter, the 13’2″ rides over the bumps a bit easier. Across the wind, this is where it all changes, so you’re not going bang across the wind, but when you’re paddling into wind but slightly off the wind the 12’6″ was way more manageable paddling in that situation than the 13’2″. The 13’2″ did take a bit more effort going in a straight line, and you had to trim yourself a little bit more. That’s just to do with the overall length of the board, being slightly shorter, the 12’6″ was easier to keep in that position off the wind. The 13’2″ did get a little bit more of a hand full, so bear in mind, if you’re paddling in places, maybe you’re paddling in places where you get trade winds, winds that come from certain directions and it’s aligning with your coast, and maybe it’s cross onshore, you might be thinking that the 12’6″ might be a better bet. Which leads us on to who do we think the boards are best suited for, and what sort of paddling would you be doing with those boards. Well obviously, you’re going to be touring with these boards, or cruising with these boards. 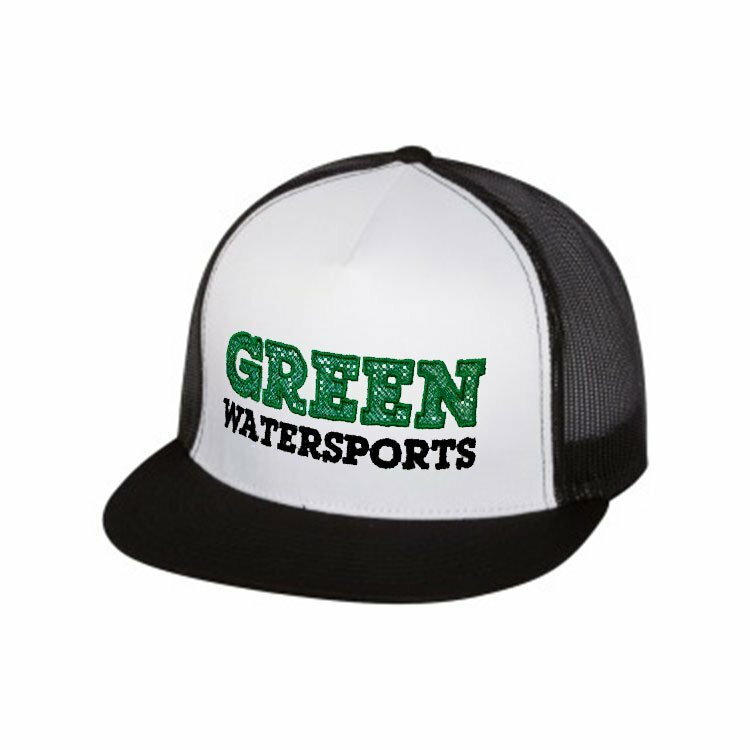 Generally, I would say if you are doing smaller touring hops that don’t require so much distance and they may be in choppier waters, definitely look towards the 12’6″ even though it’s a little bit wetter on the front than the 13’2″. The 13’2″ really is a nice long distance cruising board, straight line, plod away and keep going. Weight wise for rider, obviously, you can be any sort of weight, right up towards the top scale 110-115kg (240-255lbs) would be adequate on both these boards, The 12’6″ definitely has a bit more stability than the 13’2″ so heavier riders, maybe look towards the 12’6″. The 13’2″ would be great up to about 100kg (220lbs) of rider weight. 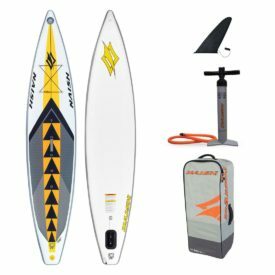 So pros and cons to the Red Paddle Co Voyager range, really looking at the 13’2″ and the 12’6″. 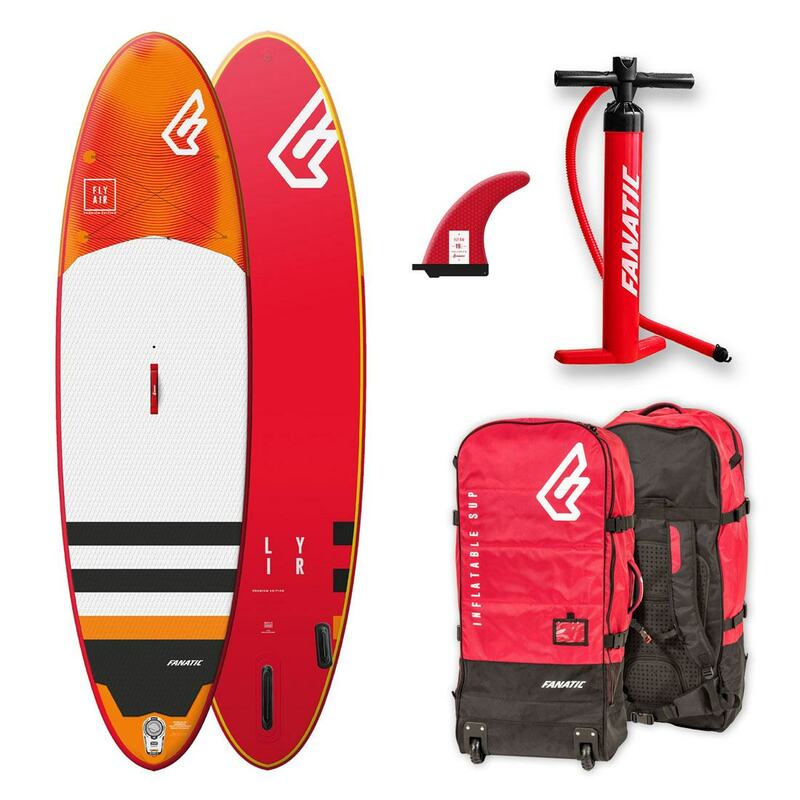 Pros: well you have got a very, very well made product from Red Paddle Co in 2018, that they have thought about and made better after year on year, the back pack is a prime example of that. Cons: you get double bungee straps with the 13’2″ but you only get front bungee straps even though there are bungee points at the back there. Totally understand that they’re not on because it’s a little bit shorter but it’d be nice if they came in the bag because straight away we wanted to use the double bungee and we didn’t have it, so you’re going to have to go to your local hardware store to get some more bungees. Otherwise, quite an interesting one we noticed as well, the handles on the outside of the boards are further in on the 12’6″ than the 13’2″, so if you’re standing with a wider stance on the 12’6″, you might find that your feet are very close to the handles. It is a bit of a plus minus this one because the reason they have done that, as we realised when we were walking up from our paddle, is that because they are further in, when you grab the board and pick it off the floor, it doesn’t drag on the floor because that board is 2″ wider than this board, so they’ve brought the handles in and inch on either side. It just shows how Red Paddle Co do think about every single thing. So it’s not really a negative, just bear it in mind if you’re a bigger person and you want to have a wide stance, you might find those handles just rub against the outside of your toes. 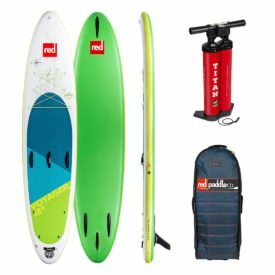 Value for money: Well, Red Paddle Co are arguably the biggest iSUP brand in the world right now and you have got a huge amount of value in this product. 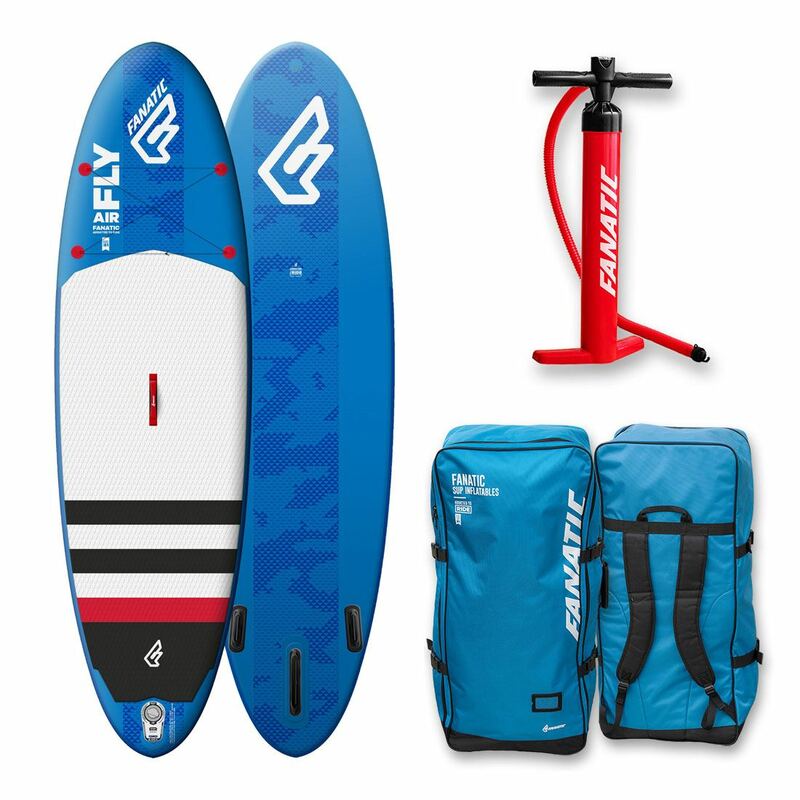 At ($1599 and $1649) for the two smaller ones, you do get a lot of board for your money, they are not the most expensive and they are definitely not the cheapest, but for the money, the amount of stuff you get, the board, the bag, and the pump, it really does fit a good price point package. So, Rueben does a great job of covering each board. If you need any questions answered or still can’t decide which one to choose, give us a call on 1-888-252-4983 or send us an email via our contact form. Posted on March 18, 2018 by Julian Kidd.